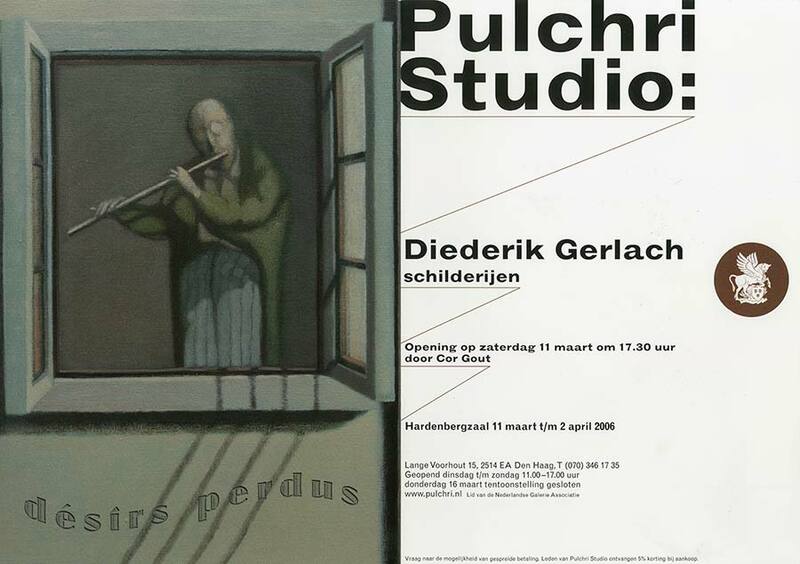 Diederik Gerlach is an avid collector of visual material, that is to say photographs or reproductions containing subjects which are useful to him. These images from brochures and picture postcards, but also a piece of fabric, a colour or a typeface from another age, convey something of the sense of the world as he experienced as a child. He describes that world as “a despondent optimism, in which I could not participate at all”. Perhaps his basic theme lies here – in an unnameable territory of the spirit where the things that surround him and the behaviour of adults combine to form a distressing whole, something that is totally alien. All of Gerlach’s works is rooted in this atmosphere. “You paint about what you know”, is how he puts it. This initial stress is made manageable by the fact that he draws on it to make new images. The fact that he works with images, often townscapes or landscapes in which he recognizes an atmosphere of bygone days, does not make him a painter of mere pictures. By his treatment of the subject the nostalgic lookback is undermined in advance. Gerlach’s working method is focused on the image which has to be realised, not on the depiction of a landscape. He regards the topographical subjects so often reproduced here as a means, as the building stones of the representation. In Wattwil and Zürich a peculiar building is situated in the middle of a realistic depiction of a landscape. The views of the town which were actually perceived by the artist are assembled in a personal reconstruction. Not too far under the surface there is a certain humour in Gerlach’s juggling with reality and art. The absurdity of the combination of images – one of the most obvious characteristics of his work – is a consequence of his inclusive use of the means of painting. 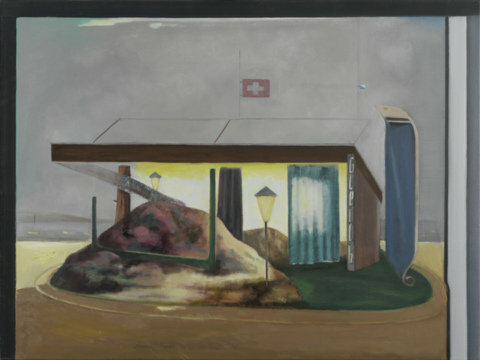 The composition of Woltersdorf – with a curtain on the left and part of a wall with a signboard projecting forwards – is defined as a more or less normal view on the deserted terrace of a cafe. The image gets more complex by an abstract composition in blue and ochre which is very ambiguous as to its spatial situation. The notion that a kind of constructivist composition has descended like a Fremdkörper on a lawn in a German out-of-the-way place sets me off laughing. Gerlach used two pictorial conventions equal to each other at the same time. The very soundness of the composition lends credibility to the impossible. That the absurdity of the image is good for a laugh, is an additional effect which the painter does not shun. Diederik Gerlach uses colour in a very personal way which is not focused on capturing natural light. Neither does he attribute an independant value to the colours. He is devoted to the whole, to tonality. Tone, colour and atmosphere of his work can be characterized as subdued. His selection of subject-matter – his themes as well as his attachment of painting (which his art is also about) – reveals melancholy. Someone who continually forces elements with their own history and associations into a new desired cohesion is undeniably somewhat obsessed. He does not make things easy for himself by wanting to forge a harmonious image from such disparate elements. This makes him a conscientuous artist. Painters do not always go in search of tradition. They don’t need to do so either, because it is inherently present anyway. Some painters however are very open to working with it, so that historical awareness is important to them and forms part of their subject matter. Diederik Gerlach is one of this company. Sometimes explicitly and always by implication, his work alludes to another period in a quite specific fashion, because the relation in it between ‘yesterday’ and ‘today’ is not always a harmonious one. Fäden initially looks fairly accessible and is fairly open to description as well as containing historical reference points. 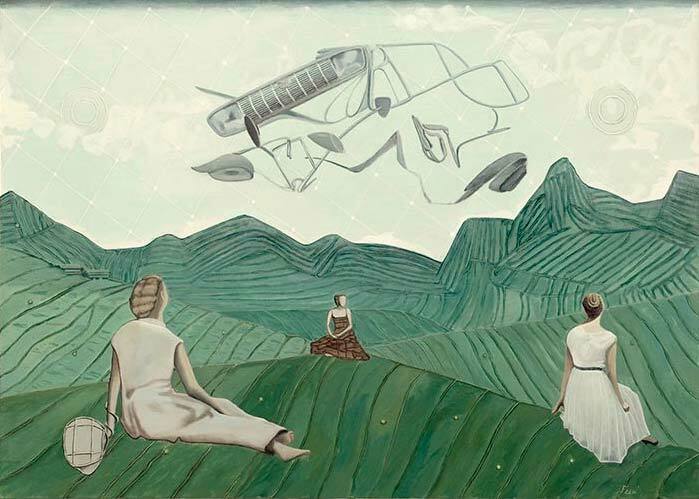 The title undoubtedly alludes to the threads behind the sculpture in the sky (only just recognizable as car parts) and to the stitches that hold the landscape together and that link the three women – who remind us of Caspar David Friedrich in the static way they are presented – too. It is anything but a ‘realistic’ scene, the mountains for instance are painted in a purely schematic way. The scene is self-contained and that too contributes to the static almost solemn or even ritual atmosphere the nature of which again is hard to pin down, because we do not in fact know what is involved here, what these women are doing here or what they represent. The reference to German Romanticism is then rather a disguise and the surface of the painting is a stage on which actors interact in a play we are not acquainted with. The effect on the viewer is of a somewhat eerie sense of having wandered into a world that he thought he knew and which appeared familiar. We are left thus in a state of perplexity. It is not a matter of the one, historicizing world which we know about and which is therefore safe; nor is it about that other world of today’s reality because that is only present here as a twisted phantom. In other words, in terms of time we are as it were nowhere; we have landed up in an unexpected time warp where no rules are applicable and where we cannot find any direction because we lack something. We lack anything to hold onto, any sense of security, living as we do in a sort of in-between territory without any definition where everything is both self-evident and delirious. 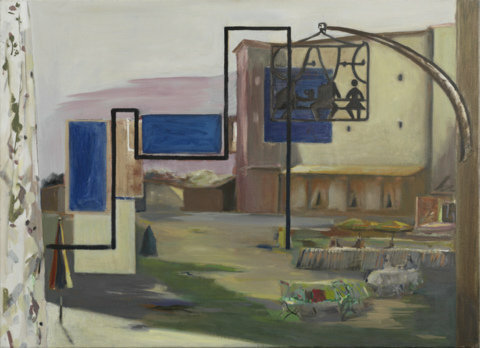 In a number of his paintings Gerlach does not deploy the appearance of a Fremdkörper as a strategy for disrupting the unity of time and creating chaos. But in that case there is always another element that provokes that feeling of Unheimlichkeit, or the uncanny. A striking instance is Vater and here I think the theme has everything to do with that feeling. 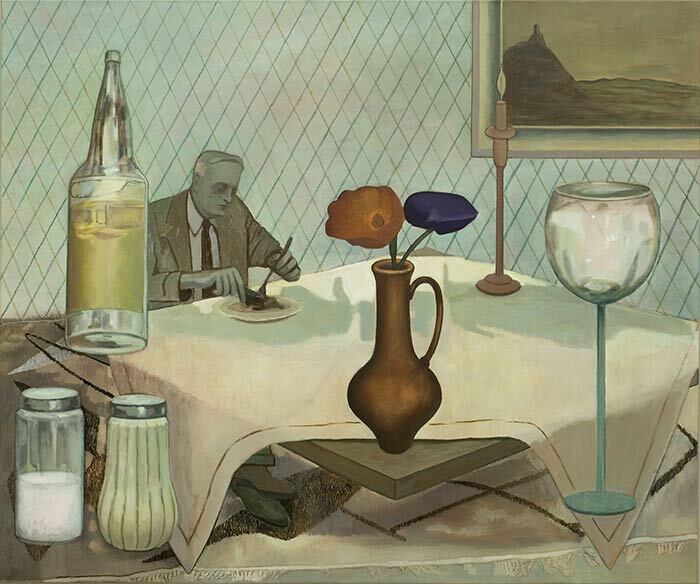 The painting shows a lonely elderly man eating alone at a table. The word ‘lonely’ occurred to me because this man is not simply alone; he also looks as though he has been abandoned by everyone, withdrawn into himself for lack of a better option. 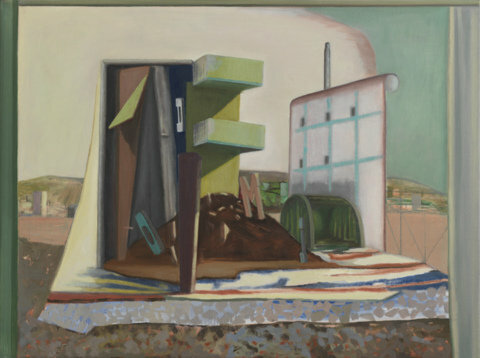 Apart from the neutral criss-cross pattern of the walls and a just visible part of a landscape painting on the wall, the objects on the table are so large that they do violence to any possible physical reality. They are in themselves everyday objects of no great importance such as one finds on any dining table – a bottle, a glass, a candle in a candlestick, pepper and salt cellars and a vase with two flowers. The paradoxical relation in scale between the man eating and the objects on the table must mean something and this meaning will probably be the key to the work. Perhaps the fact that he is sitting at such a distance on the far side of the table, looking so small and relatively insignificant, indicates that he is already dead. That would mean that the canvas is conveying an even greater feeling of powerlessness – the most trivial objects around him are superior to him, even in their longevity. That would make this painting an in memoriam, an after-image of the father painted by the adult child for whom he was once the image held up before him. Meanwhile the image this painting consists of passes no judgement; it speaks for itself, in two senses of the word. It isn’t hysterical, because it is restrained. It is also not distant, because it displays itself openly. Its tone is one of compassion, a mild melancholy, and a deep awareness of the eventual absurdity of the things we have to come to terms with and with which we must sometimes reconcile ourselves. Perhaps the autobiographical aspect plays a role (I don’t know the details), but I find it a profoundly moving work. And like Diederik Gerlachs remaining paintings, , its subject is eventually a lack of something or even lack itself and a vague longing, for what I don’t know; I am thinking of something that has never existed, except in the heart of a child or in paradise – the innocence of that which was whole but which had to be broken sometime. That’s how it is, the life of a person and the same is true of the work of a painter. “Wie Diederik Gerlach’s werk als nostalgisch of melancholisch bestempelt mist één of meerdere facetten. Ik zie in zijn schilderijen niet een zich terugtrekken in het verleden en zeker geen zwelgen erin. Waarmee ‘nostalgie’ als dekkende term is afgewezen. Melancholie dan? Dat begrip reikt verder, omdat daarin iets steekt van pijn en prikkel om de droom te willen pakken en ombuigen, hem te willen doorgronden en sturen.